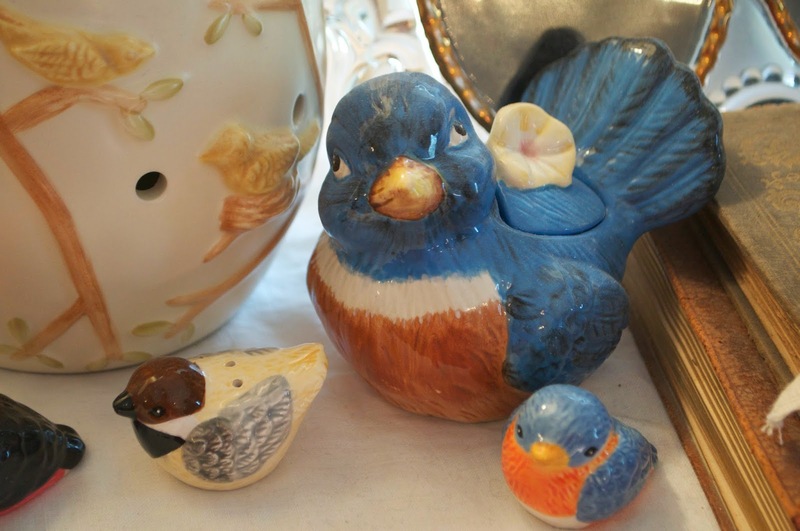 Last week when my mom was here, we went shopping at an antique mall in Rogers and she bought me this set of four little birdie shakers (see the other two in the first pic). They represent all the new birds we've seen since living here. 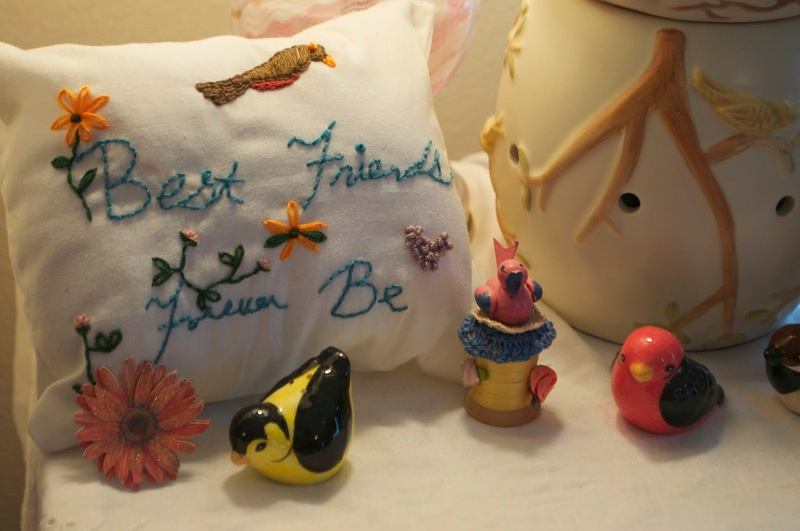 My favorite spoolie also has a pink bird on top, and my daughter, Lynzie, embroidered this pillow for me with birds on it. Wait a minute? How did she get in here? Kynthia was hanging out with my while I was snapping pictures and wanted to do a funny pose with her crayon. I've had this bird for a really long time. It's one of the first ones that started my collection. This pretty pink bird was attached to the sweet spring basket a blogging friend made me several years ago in a swap. I made this wreath a couple years ago and added a bird and a nest. It's one of my favorite things! Hope everyone has a lovely weekend! We're planning on spending our Pink Saturday at the library in the morning and then picnicking at the lake for the afternoon! Visit Beverly's Pink Saturday for more pretty pinks! I like your wreath, too. :) It's very happy! I have some birds in my pink Saturday post...but they're chickens...again. Those little buggers seem to get into all of my photos, like your little girl. :) Enjoy your weekend! pretty birds...I am glad you like the shakers, love, mom. Nice you shared some of your birds with us. I also have several thta are just dust catchers now. My favorite, of course, is of little sweetie and her crayon. Love them all ! Have many around my house too because they make me smile. What fun things to collect. They are so cute! So nice of your Mom to buy you something you love to collect. Love all your touches. I especially like the saying the wreath. Perfect sentiment!